Song of the Current absolutely blew me out of the water with its levels of epic. Also please pause for a moment because I just made a PUN. HA! Because it’s a book about smugglers, pirates, ships and rivers, get it? Yes you get it. You’re clever. It’s ABOAT time I found a FERRY impressive book about sailing, because OH BUOY are we in sore need of REELY good ship books in our lives. I’d LAKE to say I’m in love and leave it at that….buuuuut SCHOONER or later I’ll need to actually get on and write a sensible review. * I’m lying. Fish fingers are NOT delicious. All fish is gross and should not be eaten. ** A little contrived? All of it? YOU BETTER BELIEVE IT WAS. BOOM. One of my favourite things has to be the world building! * Haha okay I promise I’ll stop. The characters were also buckets of splendour. I particularly loved our leading lady, Caro. She’s stubborn and feisty and loyal and brave. She’s in love with the water and her boat and when her dad gets thrown into jail for not smuggling something for the royalty? CARO DOES IT. Aka she gets a letter of the marque and becomes a privateer. Caro…my hero. She’s also biracial! And she will stab you in the eye if you insult her ship, which seems fair. I also loved the romance! It’s a hate-to-love fest with Caro getting entangled with an important and stuffily vain boy who needs her help. Their banter is EXCEPTIONAL. Mostly because they hate each other. I ship these two onboard their little ship as the most aesthetic of ships. #PetitionToDrownCaitIfSheSaysSHIPOneMoreTime Markos is forever my favourite. He dresses nicely, he has no idea what anything does on a ship (#relatable), and he fiercely loves his family (who aren’t so great but what can you do) and he is badass when he’s finished being vain. Basically: the most insufferable and beautiful boy. I can’t but help appreciating someone who wears a nice coat before charging into a fight. The plot was engaging the whole time! Although all the sea/ship explanations lost me. However it did make the book feel REEL. * I mean, oh look there’s a piece of rope and the ship has a bow and stuff goes boom. But you can also tell the author really knows her ships! And I loved that there was plenty of sailing, sneaking, gunshots, and everyone skulking around like pirates. Which they kind of were, so #nice. Also plenty of FIGHTS and moments of direness. * Haha you thought I was going to stop punning. HA @ you. I did guess all the plot twists. So either I read too much or they were a little predictable. It didn’t really grab me emotionally? But then I am also a Vulcan. But I just felt SAFE the whole time and I would’ve like to have me timbers shook. This is definitely a book I thoroughly shout at you to read! It is a murky stories of rivers and pirates, smugglers and guns, sea gods and monsters. It was beautifully and engagingly written with characters I fell totally in love with! I WANT MORE. I love love looooved the ending. I adored how much it empowered women and just gave us the badass female sea captains we’ve all been longing for. THANK YOU TO BLOOMSBURY FOR THE REVIEW-COPY. 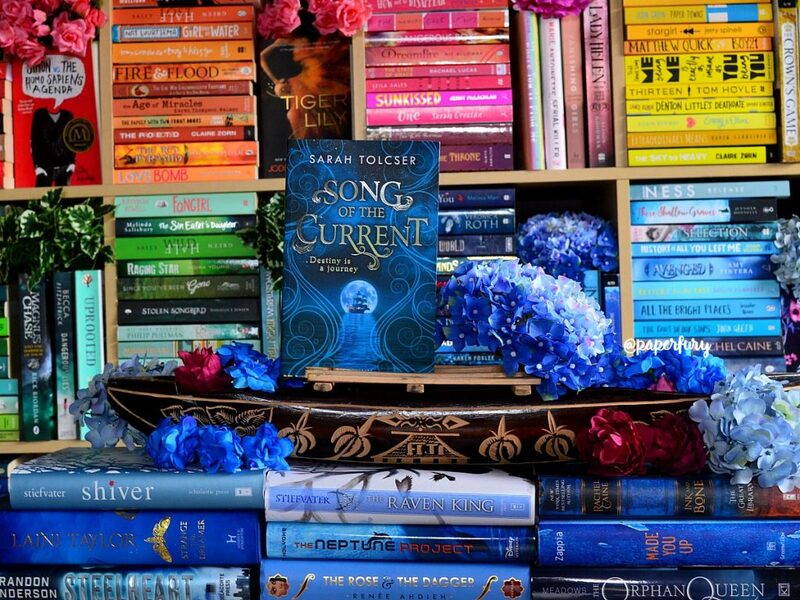 Song of the Current by Sarah Tolscer is published July, 2017.
do you like books with pirates and/or sea settings?! (please i need more recommendations!) 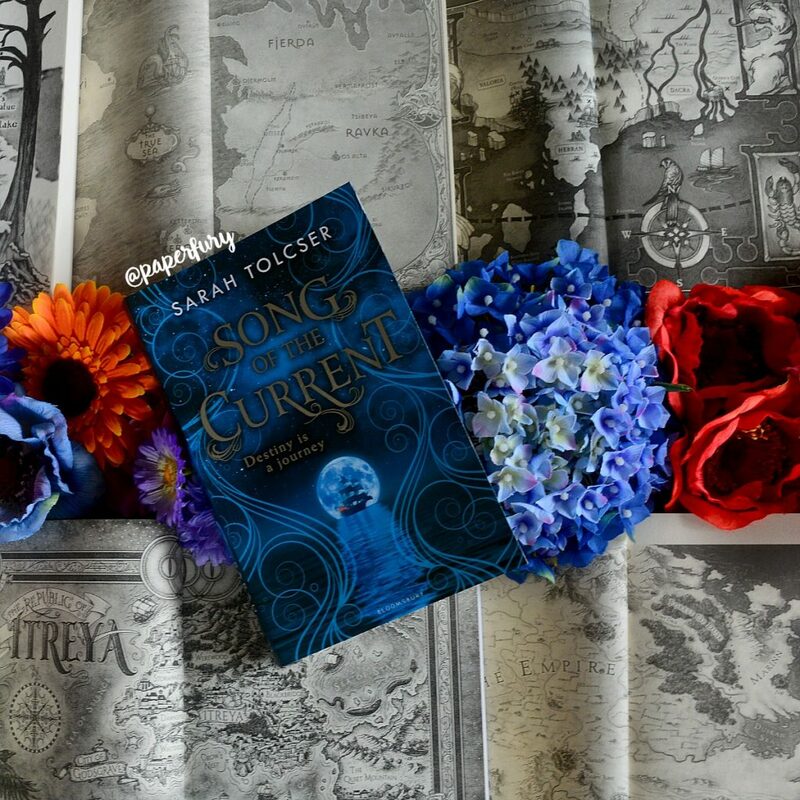 are you going to read Song Of The Current?!? and finally…do you like seafood? *adds book to wishlist* It sounds like an interesting book! It’s also a new release that has a medium size paperback available (my favourite format), which is somewhat rare #praiseforpublisher. I LOVED all the puns in this review :D. I don’t know a lot of good books about pirates to be honest. It’s not my favourite thing to read about but it can be nice to read about from time to time :). I did read a nice Belgian (Flemish) book that involved pirates, but you won’t be able to read it as it’s in Dutch. And I read and liked A. S. King’s The Dust of 100 Dogs, but you’ve already determined she’s not an author for you (the book does involve pirates though). Ohhh, I didn’t know he had a pirate series! I loved Ender’s Game so I should definitely look it up! oooooh, that book sounds cool! and I don’t mind puns, they don’t really bother me unless the speaker follows me around for hours, trying to explain why their pun was amusing until i get tired and hit them with a book. so my siblings don’t really do it anymore. Oh come now, Olive, Eragon is not about pirates. 😉 I have seen the movie so I now that much bahaha. This one is on my shelf and after reading your review I am so prepared to read it. It sounds amazing, and even just looking at the cover hooked me in. I’m glad that you enjoyed it. We all need a few more pirates in our lives. OMG THIS MAKES ME VERY HAPPY, EMMA. I hope you adore it. :’) More pirates = exactly what the literary universe needs. I love the puns!!! so much!!!! I might just have to check this book out. I have a certain weakness for pirates, though I haven’t read many books about them. The only books I can remember reading were “Isle of Swords” and “Isle of Fire” by Wayne Thomas Batson. And, since you asked, I don’t like seafood. It’s disgusting. do you like books with pirates and/or sea settings?! are you going to read Song Of The Current?!? ??? Maybe. You sure do make it sound good! and finally…do you like seafood? Fish fingers are only good with custard. Pssst…..it’s a clever Dr. Who reference. Tell me honestly, Cait: was or was not this review just an excuse for you to make a boatload of ship-related puns? Anyway. I’m now super excited to read Song of the Current, since you say it’s so marvelous! Also, between your comments on Kell previously and on Markos now, I’m starting to think you just have a thing for guys in awesome coats. *whispers* ummm yes. Yes it was. And I’m not even ashamed. I mean I barely talked about the book, I just needed room to make endless and horrible sea-flavoured puns. I just couldn’t KELP myself. LOL. This was gold just for the GIF’s. 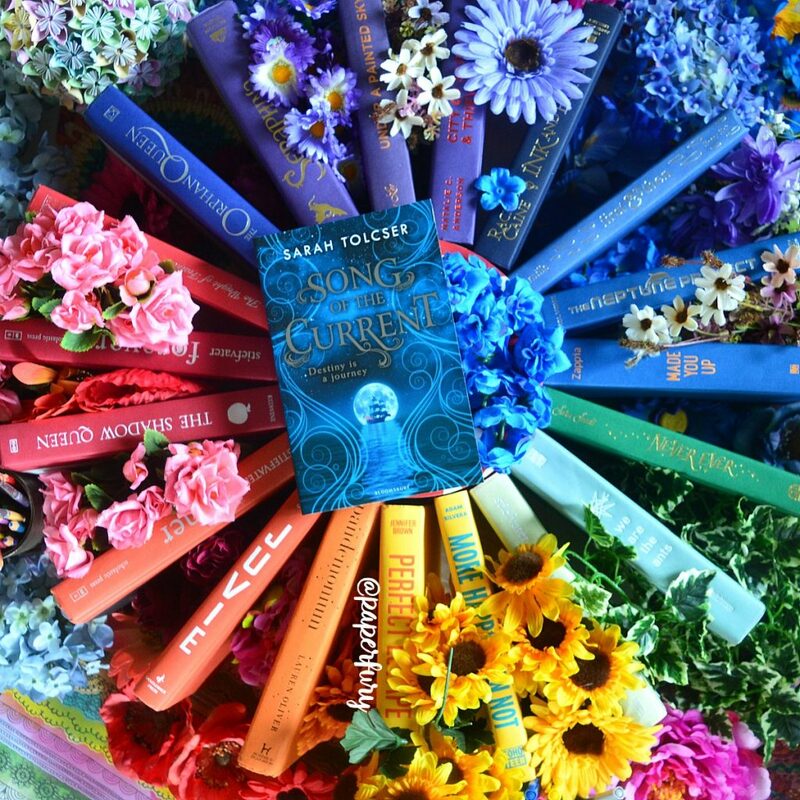 I had no idea there were so many fun YA Fantasy reads with pirates! I’m always on the look out for more sea/piratey books, that’s for sure.😂 THANKS! Yaaasss I also really enjoyed this book, so I cannot wait for the sequel! Plus, the cover is just so darn gorgeous 😀 Amazing review, as always! YES TO ALL THE PUNS. I LOVE PUNS. I DID A WHOLE POST OF BOOK PUNS ONCE AND IT WAS SUCH A GREAT EXPERIENCE (for me, at least). THANK YOU FOR THE PUNS. Okay seriously, I really love puns. BUT I DIGRESS. I love pirates and the sea and ships and water and everything pirate-y. One pirate book I keep stumbling across is the one by Daniel Handler/Lemony Snicket. Like, I’m just really interested because Lemony Snicket?? But I still haven’t grabbed it up yet? I DON’T KNOW WHAT TO DO WITH IT. I’m at a loss. I’m absolutely going to read Song of the Current! I’ve been wanting to devour it. NO NO NO. NO SEAFOOD. NO. This is one of the hills I will fight and die on. I do NOT like seafood. Okay good. We can still be friends. Because seafood is evil. PUNS: The highest form of humor. I’ve had this on my TBR ever since it was announced on Goodreads, and I am disappointed it has taken me this long to remember to read it. Surprised? No. XD Half of the books on my TBR are mystery to me, especially the mysteries. Who even remembers what’s on there? Not me. SO MUCH WIT. SO MUCH CLEVER. *falls on face* Excuse me. Haha, I’m disappointed in myself, generally, for all the books I should’ve read but I haven’t yet.😂 I actually read this one first off a netgalley approval while I was roadtripping without wifi and I’m really glad I read it so soon!! Oh my God this sounds so fricking beyond amazing! I am obsessed with pirates and did a course at uni on maritime history and shipbuilding so a female starring pirate novel is #GOALS. Also world building is my number one YA bugbear so this makes me happpyyyyy. As of this review I am bumping this novel up my TBR!! 😀 😀 have you read The Redwolf Conspiracy? It’s probably the best other YA book set on the high seas which I’ve ever read, full of magic weasels, talking rats, reality altering books and all sorts of other amazing stuff ! I for one loved all of the nautical puns, haha! This definitely seems like a book I’d read, plus I trust your judgement so I will give it a shot! I really loved this one too! I didn’t go into it with the highest of hopes, but this one really surprised me! I need the next one in my hands right now!!! lol! I also really loved the banter between them. So good! Great review! Your photos are always SO amazing (+200 points for color coordination. 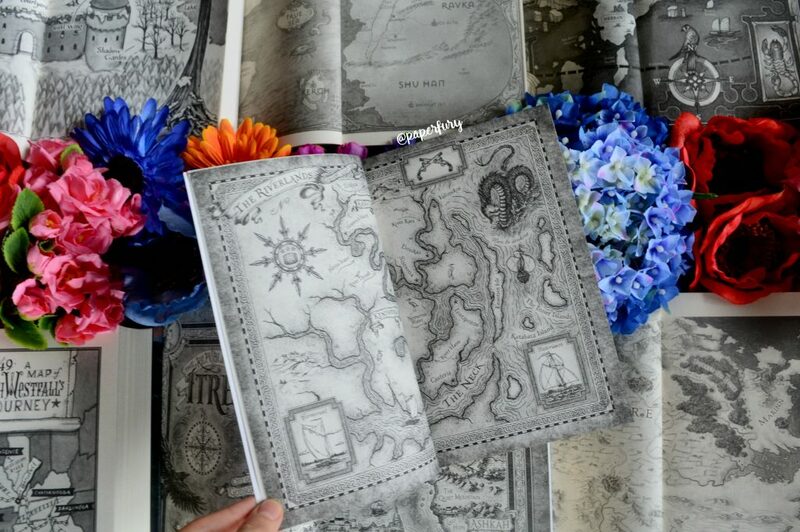 Also, really love the photo with all of the maps from the fronts of all of the books. And your puns….. were on POINT! Aww, thank you Hannah! YOU ARE TOO KIND.😂 I did have a lot of fun with this one haha! YAAAY MORE PEOPLE TO FLAIL OVER THIS BOOK WITH. I LOVEDDD how sassy the characters were and their banter! I can’t think of a more perfect couple! I can’t wait to see what shenanigans they get into in the next book! Ooh, I want to read this book now! I’ve never really read much with pirates, because when I was little I decided I didn’t like pirates (I don’t even know WHY) and so now I have it in my mind that I don’t like them… despite the fact that I’ve read basically nothing with pirates. Ever. I’m not a huge fan of most seafood, but I can tolerate it, and I’ve always really liked salmon. OH OH YOU CAN’T NOT LIKE PIRATES. PIRATES ARE MARVELLOUS. Although this is more smuggling than pirating at the beginning. :’) But it’s still so glorious. I will leave ALL the seafood to you then. 😂 Whenever my family eats fish, I take a short trip to another galaxy. I might actually have to read this one… this sounds really good. Oh wow, I wasn’t familiar with this book but it sounds AMAZING! I love pirate adventures so I’m definitely adding this to my TBR. Great review! I’ve been getting more interested in pirate books lately, so I suppose that’s a yes. My favorite is The Search for Aveline by Stephanie Rabig and Angie Bee. It’s VERY diverse and interesting because each chapter goes back and forth between the past and present day for various characters. I loved that book a lot. I’m reading The Song of the Current myself right now. I like the frog person (whose name escapes me right now). Have you seen any fan art for her? I think that would be neat to see. Yes, I LOVE seafood! I’m sorry you don’t like it, but it’s my favorite. I just wish it wasn’t so expensive. I like crab, lobster, scallops, salmon, tuna, etc. It’s all so delicious and there are so many applications you can use the different proteins in. You can have all the seafood and I’ll pass.😂 Forever. I don’t eat anything with a face. Just sayin. The Ascendance Trilogy by Jennifer A. Nielsen has some great pirates, and very “stabby” characters in general. I also read Daughter of the Pirate King by Tricia Levenseller recently, which was fun. Who likes puns? It’s (also) me. I’M SEA PLEASED YOU LIKED MY PUNS. Another perfect review, I need to put this one on my list. Eeep, I’m glad you liked the review, Skye! yOU ARE LOVELY. Same though! Like I mean, even when they left Markos I was like “well he’ll be fine”. 😂 I don’t know what it was?!? The stakes totally did seem high but I just got the vibe that nothing bad would really happen haha. Sooooo much a fan of this series though. I NEED SEQUELS. Gorgeous review as always, Cait! 😀 I don’t even know what to say… Haven’t read this book yet, but glad that you liked it even despite those low-points! Aww, thanks, Cass! You are super nice!😊 I hope you might get a chance to try it someday! Yay, I’m glad that the main character is biracial although I’m not sure I’ll be too keen on the level of ship details. But yay the pirating sounds great! A shame it was slightly predictable tho. It was definitely still worth it though. 😍 And it’s always super nice to see diversity included in fantasy. FINALLY. Very punny! Can’t say I’ve read all that many pirate stories, but wouldn’t mind having me timbers shook! (unless there might be splinters. I don’t like splinters). Those puns are actually rather impressive. And the GIF is rather perfect. I actually saw this book at the bookstore a couple of weeks ago (it must’ve come out earlier in the US) because the spine was so sparkly and I bought it. #shallowamiright I can’t wait to actually read it now though! I think it did come out a few weeks earlier in the US? And yES. Buying it because it’s also hugely pretty is totally acceptable. NEVER STOP WITH THE PUNS OKAY. NO MATTER WHAT, N E V E R S T O P. If you do, I will cry, because your puns are too good to not be shared. And DUDE I only like some fish (and I like it crispyyyyy) but that's pretty much all the seafood I will eat. No sushi. Or lobster. Or weird seaweed that is apparently healthy for you but no. I WILL NEVER STOP PUNNING. PUNS ARE MY LIFE. I am for SURE adding this to my list on Goodreads! Also…I like seafood, to a degree. I like fish sticks, and popcorn shrimp. And I hope you like this if you get a chance to read it! OMG your title just sucked me in I love ocean-ship-pirate-swashbuckling books! btw I love your reviews you have a very transparent and quirky and silly personality that comes out beautifully when you write. Thanks for sharing. Yaaas, I’m glad you like the sound of this one! 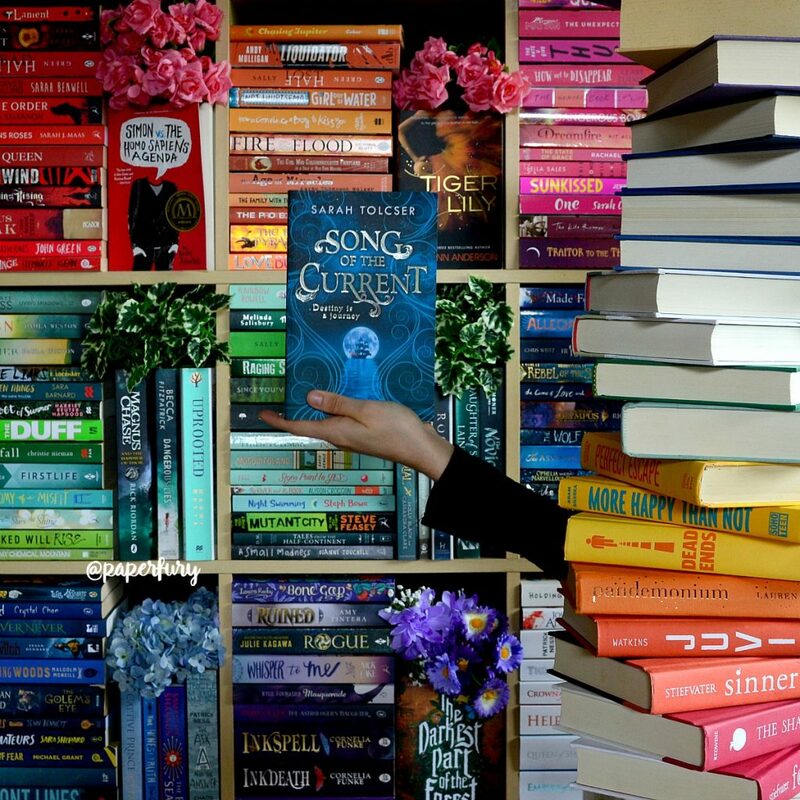 And I relate very hard to the “exceedingly high tower of TBR books”.😂 MY LIFE TOO. lol Yes. I”m not alone! Well I keep downloading all these enticing free books from blogs/newsletters promos and they accumulate faster than I can read – also some of them are more books I’m only in the mood for once in a while.. And then there’s the books i actually want to buy which is a ridiculously long list.. And then there’s the paperbacks at home. My vision is slightly poor so I don’t usually read paperbacks anymore, even though I can, My apartment has terrible lighting. Outside is much better of course. I have this out from the library right now! Nothing is better than a good bantery romance and Caro sounds awesome! I also like the sound of the worldbuilding- descriptive but not overwhelming details are key because I get confused with fantasy easily sometimes. Ahhh pirate books are awesome, great review! I’m adding this book to my TBR. I read “Daughter of the Pirate King” and was searching for another pirate book people liked. I do like a good pirate story. Aww, seafood. Would like some shrimp. If you review something you like, I invariably add it to my TBR…. you just make it sound so delightful!!! Anyhow. This has been added to the list! I’M VERY CONVINCING I KNOW.😂 But this one is so so good!!! So much recommend! !